Sir Ka-shing Li, GBM, KBE, JP was born on 29 July 1928 in Chaozhou, China and is known for his success story in having risen from poverty as a school drop-out to now be the richest person in Asia. Li Ka-Shing is one of the most impressive businessmen in the world, being entirely self-made. So just how rich is Li Ka-Shing? Forbes has estimated that Li’s net worth has reached over $33 billion in 2015, accumulated from his diverse business interests, originally in manufacturing plastics and then moving into real estate, and many other businesses, and now ranking him as the 17th richest person in the world. Actually Li couldn’t complete school because of his father’s early death, but consequently learnt all he could from his job in the factory manufacturing plastics, so that by 1950 he was able to start his own company in Hong Kong, with borrowed funds, eventually becoming the largest producer of plastic flowers in Asia. His net worth was growing already. Li Ka-Sing’s move into real estate was almost accidental – in 1958 he couldn’t lease property any longer for his company, so had to buy and develop a site himself. Then an opportunity purchase land occurred after the 1967 riots, when many people left Hong Kong. Property prices dropped, but Li, believed that the crisis was temporary and property prices would eventually rise, so bought land at low prices. By 1971, Li named his real estate development company Cheung Kong after Chang Jiang or the Yangtze River, the longest river in China. In 1972 Cheung Kong Holdings was publicly listed on the Hong Kong Stock Exchange. Of course, Li’s net worth rose exponentially. 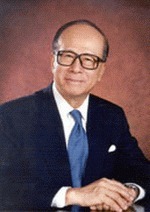 In 1979, Li bought his now flagship company Hutchison Whampoa Limited from HSBC, creating a huge conglomerate of many industries, most notably in container port facilities around the world, including in Hong Kong, Canada (in Vancouver), China, the United Kingdom, Rotterdam, Panama, Bahamas and many developing countries. In total, Li’s businesses control 13% of all container port capacity in the world. The contributions to Li’s net worth may be imagined. A subsidiary, the A.S. Watson Group (ASW), is a retail operator with over 7,800 stores around the world, including Superdrug (UK), Marionnaud (France), Kruidvat (Benelux countries), and in Asia health and beauty retailer Watson’s store and wine cellars, Park’n’Shop supermarkets (and spin-off brands), and Fortress electrical appliance stores. ASW is also involved in water products and other beverages in the region. Hutchison Whampoa group also builds-up and then sells businesses, for example the sale of its interest in Orange to Mannesmann Group in 2001 made a profit of $15.12 billion. In 2006 Li sold 20% of Hutchison’s ports business to Singapore rival PSA Corp., making a $3.12 billion profit on a $4 billion deal. Hutchison Telecommunications, nearly 50 percent owned by Hutchison Whampoa, sold a controlling stake of 67% in Hutchison Essar, a joint venture Mobile operator in India, to Vodafone for $11.1 billion, originally investing about $2 billion. Recently, Hutchison Whampoa, bought the UK’s second largest mobile operator, O2, combining with the three it already owns to form the sector’s largest UK mobile firm. One can only imagine what contributions these deals make to Li Ka-Sing’s net worth. There are many more interests in Li’s portfolio, however, Li is also regarded as one of Asia’s most generous philanthropists, donating over US $2 billion to various causes. In his personal life, Li Ka-Sing was married to Chong Yuet Ming from 1963 until her death in 1990. Their sons and Richard, are heavily involved in the family business.